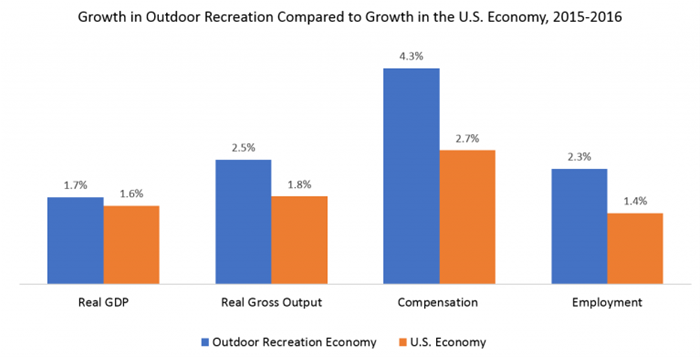 WASHINGTON, D.C. – The Motorcycle Industry Council joined the Outdoor Recreation Roundtable in welcoming the final report on the first-ever government statistics recognizing the outdoor recreation industry as a significant contributor to the U.S. economy. The report also found Motorcycling/ATVing to be one of the fastest-growing core outdoor recreation activities, growing 8 percent over the previous year. The September 20th release was the final revised report, following prototype statistics released in February. The updated report reflects comments and feedback solicited by BEA and submitted by organizations representing the powersports industry, as well as other groups in the outdoor recreation economy. The Outdoor Recreation Roundtable is the nation’s premier coalition of outdoor recreation trade associations. Go to www.RecreationRoundtable.org for more information on the coalition’s activities and membership.